Richey Beckett has just released two new limited edition t-shirts based on his popular art perfect for gifts this holiday season. The “Aurora” faded black t-shirt (£30) features Beckett’s take on the Roman Goddess of dawn, who's daily rebirth would herald the arrival of the Sun. The “Exploding Skull” long sleeve t-shirt (£35) design came to life while Richey was working for the Grateful Dead and experimenting with his own expanded skulls inspired by the Dead’s iconic Stealie logo. This is Beckett’s first ever limited edition long sleeve shirt. 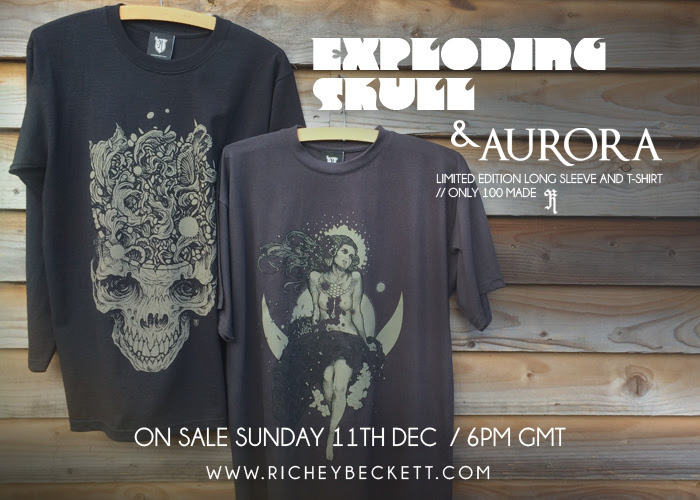 Each of these Richey Beckett t-shirts are strictly limited to 100 pieces (that's less than 30 of each size), and come packaged in a custom signed and hand numbered gift box. Fans can purchase these tees, available in sizes S-XL, now at the Richey Beckett online store. Once these shirts are sold out, these specific colorways will never be printed again.